Good Morning, this is Capital Essence’s Market Outlook (the technical analysis of financial markets) for Monday October 22, 2018. We’ve noted in the previous Market Outlook that: “the near-term technical bias remains somewhat bearish as S&P’s testing key price levels. More backings and fillings would not be a surprise.” As anticipated, stocks traded higher in early Friday session that saw the S&P adding as much as 1 percent. However, sentiment soon shifted, prompting a slow and steady retreat into the red. For the day, the bench mark gauge closed just below the flatline at 2,767.78. The Nasdaq Composite fell 0.5 percent to 7,449.03. The Dow Jones Industrial Average rose 0.26 percent to 25,444.34. The CBOE Volatility Index (VIX), widely considered the best gauge of fear in the market, fell less that 1 percent close at 19.89. The defensive utilities, consumer staples and real estate sectors finished atop Friday’s leaderboard. Defensive sectors typically refer to industries that see levels of growth that are lower, but more stable, than the overall economy. Because they are less tied to the pace of economic growth, they tend to outperform in periods of uncertainty. The Utilities Select Sector SPDR ETF (XLU) rose 1.56 percent to 54.57 on the day and is up 3.6 percent YTD. Now the question is whether the rally has more legs? Below is an update look at a trade in XLU. Our “U.S. Market Trading Map” painted XLU bars in green (buy) – see area ‘A’ in the chart. 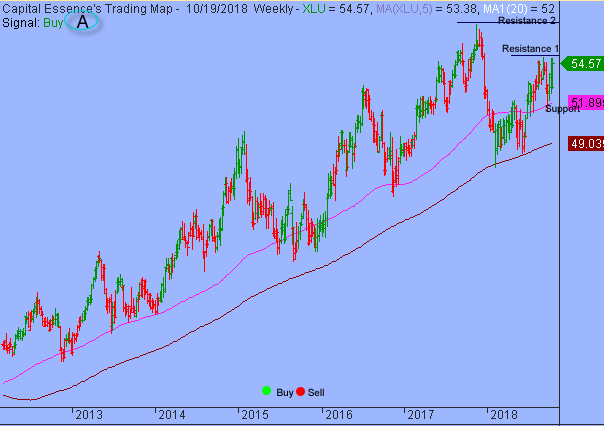 XLU has been on a tear over the past few weeks after the September overbought correction tested and respected support at the 1-year moving average. That level was significant when XLY climbed above in the late June. It’s now acting as key support. This week rally pushed the ETF up against the September high, around 55. A close above that level on a weekly basis has measured to around 57.30, or the late 2017 high. Short-term technical outlook shifted to bearish. Last changed October 19, 2018 from slightly bearish (see area ‘A’ in the chart). 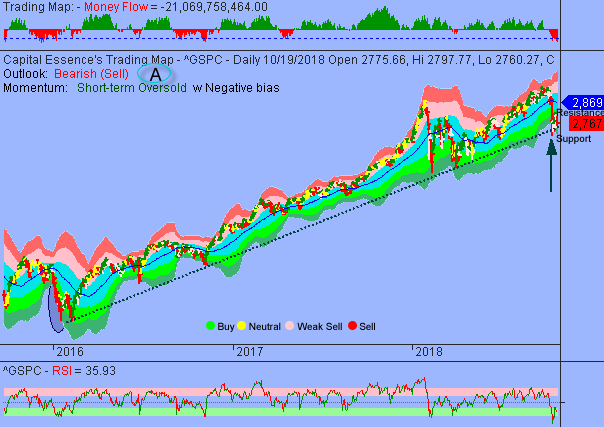 S&P continues basing sideways using the 2016 rising trend line as support after the early rally attempt ran out of steam near the important sentiment 2800 mark. Money Flow measure hovers near multi-year low, indicating a negative net demand for stocks. Momentum indicator rolled over from near oversold zone, indicating an internal weakness. These elements will continue negatively affect trading sentiment over the coming days. Near-term, the market had carved out key support and resistance for traders to monitor. Support is strong near the 2700 zone. This level has successfully tested last week and won’t go down without a fight. A close below that level will break the multi-year uptrend and has measured move to around 2600. Resistance is strong near the 2830 zone. A close above that level will turn the short-term trend up and trigger acceleration toward the early October high. Short-term trading range: 2700 to 2825. S&P has support near 2767. A close below that level has measured move to 2700. The index has resistance near 2825. A close above that level has measured move to 2869. In summary, the fact that the S&P is basing sideways near key support as it worked off the short-term oversold condition rather than bouncing higher, indicating an internal weakness. Several short-term indicators are pointing toward further weakness, suggesting that S&P’s 2700 might not hold for long. A failure to hold above key price level indicates a change in sentiment and a much deeper pullback should be expected.